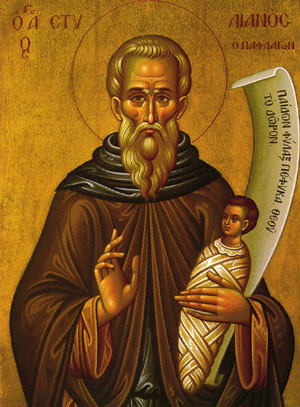 St. Stylianos was from Paphlagonia living in the latter 6th century and early 7th century. He loved the Lord Jesus Christ with his whole heart and lived in strict asceticism. When he fell asleep in the Lord, his face shone like the sun and an angel appeared to take his soul to Glory. His prayers have worked many miracles, both during his earthly life and since. He is of special help to children who are ill and to childless couples. He is known as a protector of orphans. Share the feast of Stylianos the Monk of Paphlagonia with an icon greeting ecard.